The 7 vs. 7 Tournament that was held over the weekend by the St Kitts Nevis Football Association was a tremendous success. The Tournament was held over two days and saw twenty-eight teams from both the Premier and Division 1 scheduled to compete for the championship. The tournament organized in a format where Premier teams would compete against Division 1 teams. The knock out format of the tournament meant the winner advanced to the second round of the tournament on Sunday. After the first day of the tournament there were six Premier teams and eight Division 1 teams advancing. The tournament seemed that it would be dominated by Premier Division teams but that would not be the case. Sunday began with the top two premier teams, S L Horsford and Newtown United playing each other. Newtown United defeated the S L Horsford St Pauls in penalty kicks to advance to the quarter finals. The other quarter finals teams were Coury Gatorade Conaree, St Thomas/Trinity Strikers, Cayon, U-15 National Boys, Village Superstars Jrs , Mantab and Trafalgar Southstars. The main event of the quarterfinals was the match between Newtown United and Coury Gatorade Conaree. Coury Gatorade Conaree scored first early in the game. At the end of the game Coury Gatorade Conaree won 3-1 to advance to the semi finals. 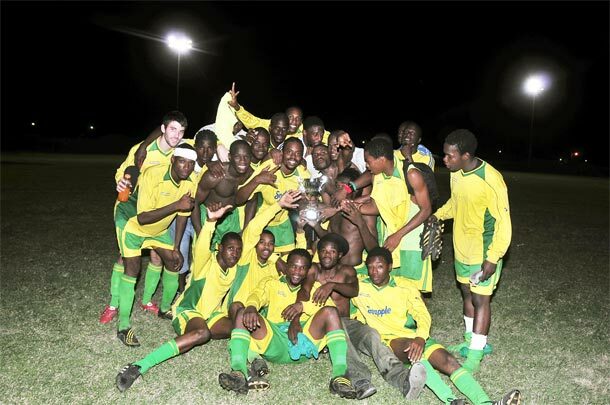 The other upset of the quarterfinals were Cayon versus St. Thomas Trinity Strikers 1-0 to Cayon. During the Semi Finals Village Superstars Jrs upset Mantab by winning 1-0 to advance to the finals. This game proved that the Division 1 teams were playing to win the championship and would not be outdone by the Premier teams. The second semifinals game resulted in Coury Gatorade Conaree defeating Cayon 1-0 advancing to the finals. The final matchup was an exciting and sometimes physical match between the younger and less experienced Village Superstar Jrs and Coury Gatorade Conaree. Village Superstars Jrs players were not intimidated by the Conaree team and played with the zeal and intensity expected for a championship match. The game was well contested but the experience of the Coury Gatorade Conaree resulted in them defeating Village Superstars Jrs 3-2 at the end of the game and claiming another championship. Coury Gatorade Conaree has won all three of the small tournament held this year. They won the Sugar Mas Cup in December, The 5 Vs 5 in January and now the 7 vs 7 over the weekend. The event accomplished its goal by having teams playing a different format of the game, being ableto make decision faster and accuracy at shooting goal. The tournament was well attended by the Saddlers and surrounding communities and the St Kitts Nevis Football Association would like to thank White Gate Development Corporation, Digicel and all the persons who contributed to the tournament.